Tucker is a city located in DeKalb County, Georgia, United States. It was originally settled in the 1820s, and later developed as a railroad community in 1892. According to the 2016 United States Census Bureau annual estimate of resident population, it has a population of 35,322. In a November 2015 referendum, by a 3:1 margin (73.94%), voters approved incorporating Tucker into a city. In March 2016 Tucker residents elected the city’s first mayor and city council. In 1821, the area that would become Tucker was in Militia District 572 in Henry County. The state created DeKalb County on December 9, 1822, and District 572 became DeKalb’s 18th District, or the Brownings District, reportedly named for Andrew Browning. Among the thirty cemeteries within a 4-mile (6 km) radius of Main Street, approximately 30 graves belong to individuals born in the 18th century, four of whom are Revolutionary War soldiers. Twelve graves belong to Confederate soldiers. In spite of DeKalb County delegates voting against secession from the United States, Georgia joined the Confederacy and seceded from the union in 1861. The full reality of that decision marched into Tucker in July 1864. Union soldiers camped at Henderson’s Mill, used the Brownings Court, one of the few buildings in the area they did not burn, dismantled the railroad to Stone Mountain, and formed the left wing of Sherman’s advance to Atlanta. In 1886 the Georgia, Carolina and Northern Railway received a charter to build a new rail line between Monroe, North Carolina, and Atlanta. Prior to the project’s completion, the company leased the road to the Seaboard Air Line Railroad system, a collection of regional railroads headquartered in North Carolina eager to extend its reach to Atlanta. Seaboard built depots at a number of small villages, often little more than a crossroads, and named them for railroad company officials. The depot at Jug Tavern, for example, was named for Seaboard’s general manager, John H. Winder. The stop at Bryan was named in honor of the system’s general superintendent, Lilburn Meyers. Although the origin of the name is unknown, it is possible that the next stop, in the Brownings District, may have been named for Rufus S. Tucker, a director and major shareholder in several Seaboard system railroads. At the DeKalb County Centennial Celebration in 1922, Charles Murphey Candler stated that Tucker a “prosperous and promising village on the Seaboard Air Line Railway . . . was named in honor of Capt. Tucker, an official of the Seaboard Air Railway.” Some residents attribute the name to a local family with the surname Tucker. The first train steamed into the new Tucker station on Sunday, April 24, 1892. Originating in Elberton with a final destination of the Atlanta suburb of Inman Park — a four-hour trip — the Seaboard train consisted of two cars carrying 150 passengers and a baggage car. Two months later the US Postal Service appointed Alpheus G. Chewning first Postmaster of the Tucker Post office. Rural Free Delivery began on March 2, 1903. In 1967, the Seaboard Air-Line Railway merged with the Atlantic Coast Line to form the Seaboard Coast Line Railroad. In 1980, the company merged with the Chessie System to form current railroad operator, CSX. Although no longer a train stop for passengers, the Tucker depot is currently a CSX field office for track repair and signal maintenance. Tucker, at 1,117 feet (340 m) feet above sea level, is the highest point of elevation on the railroad line between Atlanta and Richmond, Virginia. 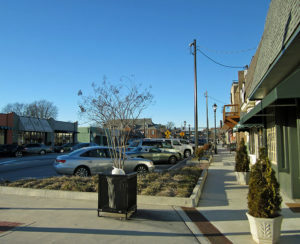 Following World War II, Tucker began a steady transition from an agricultural community to a mixed industrial, retail, and residential area. The strength of a county-wide water system extending into Tucker by the 1950s, and the post war establishment of nearby employers in other areas of the county including the CDC in 1947, General Motors in Doraville, Kraft Foods in Decatur, and the growth of Emory University, brought new residents to Tucker from across the nation. Descendants of early settlers subdivided and sold family land for neighborhoods and shopping plazas. Local community leaders opened Tucker Federal Savings and Loan, created a youth football league, and by the 1960s newspapers identified Tucker as “DeKalb’s Area of Golden Opportunity.” The Baby Boom drove the growth of DeKalb County schools and with the affordability of the car, the expansion of the highway system, and inexpensive fuel, Tucker became an ideal location to call home. Tucker is located in northeastern DeKalb County at 33°51′6″N 84°13′17″W (33.851736, -84.221524), approximately 15 miles (24 km) northeast of downtown Atlanta. According to the United States Census Bureau, the CDP has a total area of 12.1 square miles (31 km2), of which 12.0 square miles (31 km2) is land and 0.1 square miles (0.26 km2), or 0.83%, is water. 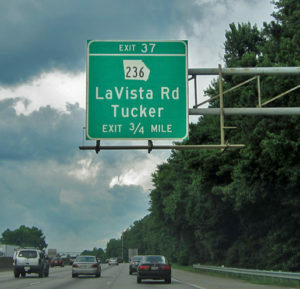 The Eastern Continental Divide cuts through Tucker, along Chamblee-Tucker Road to LaVista Road and continuing south towards Mountain Industrial Boulevard. Water falling to the west of this line flows towards the Chattahoochee River and the Gulf of Mexico. Water falling to the east of this line flows towards the Atlantic Ocean through the Ocmulgee River. Tucker is in the state’s Piedmont geologic region, composed of igneous and metamorphic rocks resulting from 300 to 600 million year old sediments that were subjected to high temperatures and pressures and re-exposed roughly 250 to 300 million years ago. Rocks typical of the region include schist, amphibolite, gneiss, migmatite, and granite. Over a dozen creeks originate in Tucker including Burnt Fork Creek, South Fork Peachtree Creek, Camp Creek, and Henderson Mill Creek. Prior to the widespread accessibility of electricity and indoor plumbing, several were used as mill ponds or dammed for baptism. From 1906 until its demise in the 1940s, Burnt Fort Creek was the primary tributary for the Decatur Waterworks. Tucker’s climate, typical of a humid subtropical climate, features mild winters and hot summers. In spite of moderate conditions compared to communities in many other states, Tucker has occasional extreme weather. The record high is 110 °F (43 °C), recorded on July 8, 1927, and the record low, January 21, 1985, −10 °F (−23 °C). As of 2012, the median income per household was $64,388, and the per capita income was $33,552. 11.4% of the population is below the poverty line, 5.6% lower that the state average. Of the 11,894 housing units identified in 2012, the home ownership rate is 70.7% and the median value of owner occupied housing units, $233,700. Multi-unit structures (apartment complexes, condominiums) represent 22% of all housing. 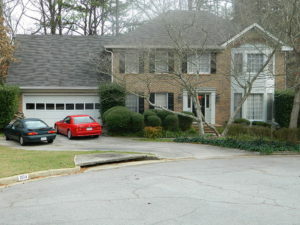 Tucker primarily consists of 1960s and 1970s-era ranch and split-level homes, and 1970s and 1980s-era multi-story homes. The latter two often feature daylight basements. Various neighborhoods are typically groups by geographic association with elementary schools and other centers of community life such as parks. The desire for community involvement continues to foster growth in various Tucker groups and associations. Some of the more significant include; the Tucker Business Association, Tucker-Northlake Community Improvement District, Tucker Civic Association, Tucker Historical Society, Main Street Theatre, Friends of Henderson Park, Friends of Johns Homestead, Friends of Kelley C. Cofer Park, Main Street Tucker Alliance, Friends of the Tucker Nature Preserve, Old Town Tucker Merchants Association, Tucker Parent Council, and Smoke Rise Community Association. With the exception of sports organizations, involving residents in multiple counties, most of these groups are predominantly led by and serve residents within the Tucker area. Tucker includes multiple Baptist, Lutheran, Methodist, Pentecostal, and Presbyterian churches; Catholic, Mormon, and over a dozen non-denomination Christian churches, some holding services in Chinese, Korean, Spanish, and Vietnamese. Several churches including Rehoboth Baptist, established in 1854, and First Baptist of Tucker, established in 1893, maintain large youth athletic programs. In the 1970s, The Church of Jesus Christ of Latter-day Saints built a regional welfare and emergency response center in Royal Atlanta Business Park. Outdoor events held on Main Street are a central part of the community for numerous residents and organizations. The Tucker Day celebration, first held in the 1950s, is an annual event typically including a parade, that runs the length of Main Street with food vendors, artist, musicians, and merchants. Other annual events on Main Street include the Taste of Tucker and Tucker Chili Cook-Off. The street is also closed for the Tucker Cruise-In held monthly between April and September. The Farmers Market on Main Street occupies a similar seasonal schedule, though weekly. The Tucker Civic Association, Friends of Henderson Park, Friends of the Tucker Nature Preserve, Friends of Kelley C. Cofer Park, and neighborhood groups regularly organize park and roadside cleanup efforts. The Tucker Historical Society hosts the annual Brownings Courthouse Day and the annual Garden Tour. The Tucker High School varsity football team, the Tucker Tigers, is a large seasonal draw for former and current Tucker alumni and residents. Like most high schools in DeKalb County, Tucker does not have a local football stadium, thus home games are technically away games. Tucker serves as corporate headquarters for several nationally recognized companies including; Oglethorpe Power, YP Holdings (Publisher of ‘’The Real Yellow Pages’’), Primo Grills and Smokers, and Inland Seafood. Tucker is also home of the U.S. Poultry & Egg Association the Emory University Orthopaedics and Spine Hospital, the Montreal Industrial district, a portion of the Northlake retail area, and Royal Atlanta Business Park. Tucker is in Georgia’s 4th and 6th Congressional Districts; Georgia State Senate Districts 40 and 41; and Georgia House of Representatives House Districts 81, 86, 87, and 88. Tucker is in DeKalb County Commission Districts 1 and 4 and Super Commission District 7. In a November 2015 referendum, by a 3:1 margin (73.94%), voters approved incorporating Tucker into a city. In March 2016 Tucker residents elected the city’s first mayor and city council. In the Tucker CDP, 91.4% of adults have graduated high school, 7% higher than the state average, and 46.8% of adults age 25 or older have a bachelor’s degree or higher, 19% higher than the state average. All public schools in Tucker operate under the jurisdiction DeKalb County School District. 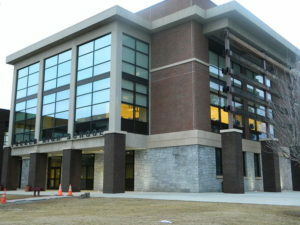 The DeKalb County School District’s Sam A. Moss Service Center is also located in Tucker. MARTA, the Metro Atlanta Rapid Trans Authority, has six daily bus routes traversing Tucker; 75 Tucker, 120 E. Ponce de Leon Ave/Tucker, 124 Pleasantdale Road, 125 Clarkston/Northlake, and 126 Northlake/Chamblee.